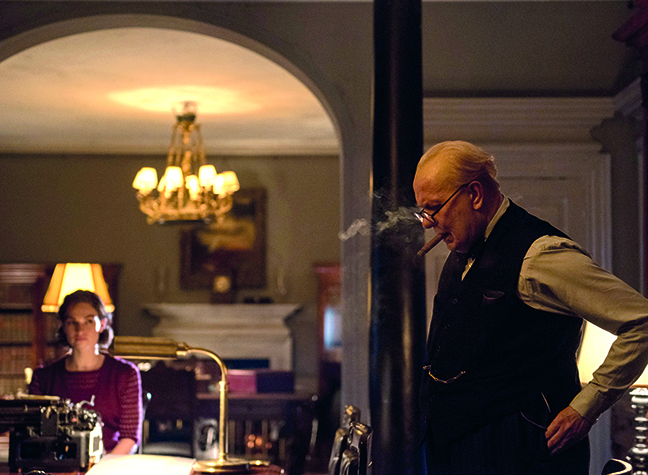 A hot pick for the awards season,Darkest Hour features BAFTA winner Gary Oldman as wartime Prime Minister Winston Churchill in a gripping story of political intrigue and high-octane drama. With a stellar supporting cast, including Kristin Scott Thomas as his wise wife Clementine and Lily James as loyal secretary Elizabeth Layton, it’s at the top of our list of must-see movies for 2018. The drama opens with the newly appointed Prime Minister Winston Churchill facing the decision of a lifetime during the early days of World War II. As the seemingly unstoppable Nazi forces advance, and with the Allies cornered on the beaches of Dunkirk, the fate of Western Europe hangs on his leadership. Churchill faces a crucial dilemma: negotiate with Hitler or battle on against incredible odds. But this is not the only obstacle on his path to victory – his own party is plotting against him and King George VI doubts his ability to steer the country in the right direction. It’s the women in his life who stand firm by his side, bolstering Churchill as he looks to the British people for inspiration to fight alongside him for the nation’s ideals, liberty and freedom. It is against this background that Churchill delivers his now-famous speech, winning the nation’s support and changing the course of history. With a screenplay by Anthony McCarten – the writer behind the Stephen Hawking biopic The Theory of Everything – and directed by BAFTA winner Joe Wright (Atonement), this rousing story is packed with brilliant insights that reveal the man behind the icon and the power of the women who stood by him. We’re giving away a pair of tickets to the UK premiere of Darkest Hour in London on 11 December 2017. Visit our competitions page and answer a simple question to be in with a chance to win and to view the full T&Cs. The competition closes at 23.59 on 3 December 2017. The winner of the tickets will be notified on 5 December 2017. Good luck!